Columbus, GA Kansas City, MO Omaha, NE Washington D.C.
Organize a Meal at a Jason's Deli Giving Back Near You! Have an Organization to Support? Request a Meal! Serving local community organizations is Jason's Deli's commitment & passion! 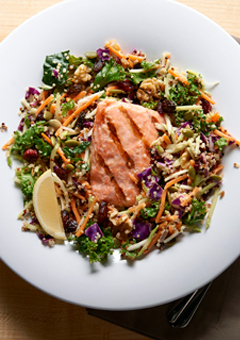 $.50 of every Salmon Pacifica Salad sold will go directly to cancer research. Too many families have been affected by cancer. Including ours at Jason's Deli and, quite frankly, we are sick and tired of our lives and loved ones being impacted by this disease. The time has come for us to do something about it! In August 2015, we began our partnership with The University of Texas MD Anderson Cancer Center, the leading Cancer Research facility in the world, to raise money aiding them in their goal to eliminate mortality rates for 8 types of Cancer by 2024.